Insulated Glazing Units, or IGUs were first patented in the United States by Thomas Stetson in 1865. But the use of these windows, which incorporated two panes of glass with a sealed space between them, did not become widespread until the 1940s when Thermopane windows became standard. Prior to this time people in colder climates had to manually replace their summer screens with winter storm windows every fall to gain additional insulation for their homes. 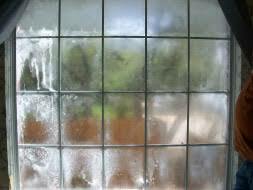 But with Thermopane windows came a new problem that was unknown at the time but one that we’re all very familiar with now, foggy windows. What gives the window the foggy appearance is actually condensation between the two window panes of glass. 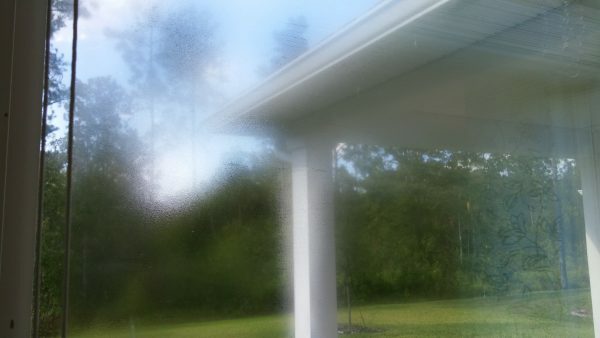 This condensation not only ruins the view through the glass, but it can lead to higher energy costs and long term moisture damage within the window. This condition can affect one or all of the home’s windows, both new windows and old. During a home inspection we always point these out to our customers. Most immediately think that the window needs to be replaced, and in some cases they do. But there are ways to fix the problem without replacing the entire window that can often be more cost effective. 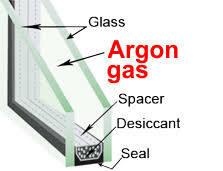 The insulating layer, or gas fills, between two panes of glass in modern residential double pane windows is typically argon gas. Argon is a chemically inert gas that occurs naturally in air. It is the third most abundant gas in the Earth’s atmosphere. Because of this it is much cheaper to use for window construction than other alternatives like krypton. It’s also denser than air, which gives it good insulating ability. This helps to keep the conditioned air in and the unconditioned air out of your home. If, as often happens, this gas escapes from the window through a broken seal the resulting void is filled with air. Almost all air contains water vapor. The window’s second defense against this moisture is silica desiccant. This is an absorbent material designed to maintain dryness in the space it protects. In a double pane window these pellets are inside the aluminum perimeter strip. Here they absorb moisture from any incoming air that enters the space between the panes. But once the seal is broken the silica desiccant is soon overwhelmed. 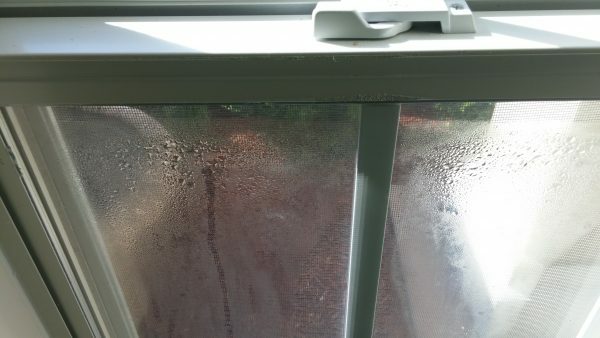 As the temperature of the window cools the water vapor in the air reaches the dew point and condensation forms. This condensation between the two panes of glass is what gives the window the foggy appearance. The good news is that the argon gas that has escaped is harmless and will quickly dissipate. The bad news is that once it’s gone, you can’t put it back which means that the problem will only continue to get worse. And on very rare occasions the escaping gas can lead to the window glass breaking. The argon, under pressure, escapes the window faster than it can be replaced by the air, causing the window glass to bend inward as the internal pressure is reduced. This can lead to the glass shattering. What causes windows to fail? The service life expectancy of IGUs varies widely depending on the quality of the material used, the width of the gap between the two panes of glass, the geographic location of the home and the direction that the window faces. All windows in a home are susceptible to seal failure but those on the sunny side of the home are more prone because they experience a greater temperature variance. This change in temperature causes the gas between the window panes to expand as it heats through the day and to contract as it cools during the night. This is referred to as thermal pumping. Over time the constant fluctuations in pressure caused by the thermal pumping leads to seal stress and eventually seal failure. There are several viable options to address condensation between the window panes. Depending on the condition and the age of the windows it might be possible to repair the windows. This is done by drilling a small hole into the window and inserting a liquid cleaning solution. This solution, along with any other moisture, is then sucked out through a vacuum. Lastly, a defogger device is permanently inserted into the hole that will allow the release of moisture during thermal pumping. This is only a solution for the condensation; it won’t return the window’s energy efficiency. This means that the window is still considered to have structural deficiencies. This is also a relatively new procedure; the long term results are not clear. Another solution is to replace just the window sash. The sash is the portion of the window that holds the glass and that moves up and down. 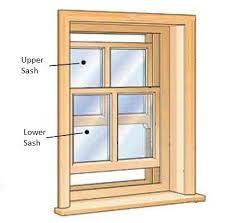 In most modern double hung windows one or both sashes can be removed and a replacement sash installed. This is probably the most popular repair option because in addition to the glazing being completely clear the window’s insulating ability is also maintained. In some extreme cases it may be necessary to replace the entire window. This is the most expensive solution and should only be considered if the windows were damaged or already in need of updating. Regardless of which method you choose to repair or replace the fogged up windows in your home, it’s important to address the problem. As with any moisture intrusion in the house, damage will eventually occur. Each situation and each window is different; have the windows evaluated by a tradesman from a professional window company before making a determination about what course of action to take.